Buy now this product together with Schüttelbrot Knabbermäuschen Trenker 200 gr. Schüttelbrot Knabbermäuschen Trenker 200 gr. ready for shipment: in ca. 5 days Schüttelbrot Knabbermäuschen Trenker 200 gr. Breasaola Valtellina PGI sliced approx. 200 gr. Levoni bresaola della Valtellina PGI is made eye of round, beef's most prized cut. Meat is "dry" flavoured with salt, pepper, wine, garlic, cinnamon, laurel and cloves. During its slow maturation phase, the product develops its characteristic fragrance and taste. Its aroma is typical of matured and spicy meat, its red colour is bright and uniform. Sextner fennel salami Villgrater approx. 350 gr. The Sextner fennel salami Villgrater is produced of pure pork, it is an aromatic house salami with light fennel marks, air-dried after Italian kind. Deer Salami Steiner approx. 250 gr. Incredibly and in the taste perfectly, so describe some customers our deer salami which stands firm every comparison. Particularly liked with hors-d'oeuvre plates, cold plates etc. in combination with other lusciousness our house. Rosemary ham Steiner approx. 500 gr. Basic material for this culinary speciality is the imperial part of the pig. With the rosemary on the surface develops the incomparable taste. House Speck Bacon Steiner 1/4 flitch approx. 1,25 kg. 21,95 EUR / 17,56 €/kg. Original Speck Bacon Villgrater 1/8 approx. 500 gr. 10,45 EUR / 20,90 €/kg. Tirol ham Villgrater 1/8 approx. 500 gr. 9,70 EUR / 19,40 €/kg. Traditional Speck Bacon Flitch of ca. 4 kg. - Butchery Hell 62,55 EUR / 15,64 €/kg. Bovine handle - Bresaola Steiner approx. 400 gr. 15,45 EUR / 38,63 €/kg. Bacon Speck finely sliced ca. 150 gr. - Butchery Hell 4,60 EUR / 3,07 €/100 gr. Ham bacon 6 months ripened 1/8 vac. core piece appr. 0.5 kg - Kofler Speck 11,50 EUR / 23,00 €/kg. Ham bacon South Tyrol P.G.I. 1/1 appr. 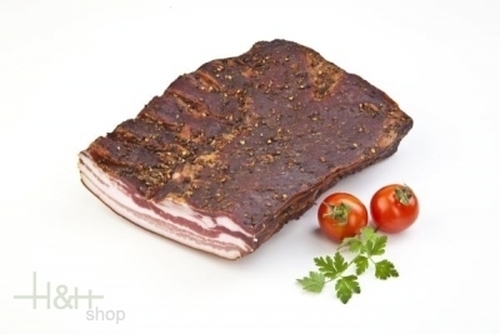 4.5 kg - Kofler Speck 63,55 EUR / 1,41 €/100 gr.